Everything you need to prep & coat your paint! Take the guesswork out of applying Optimum's legendary coating - Optimum Gloss Coat! 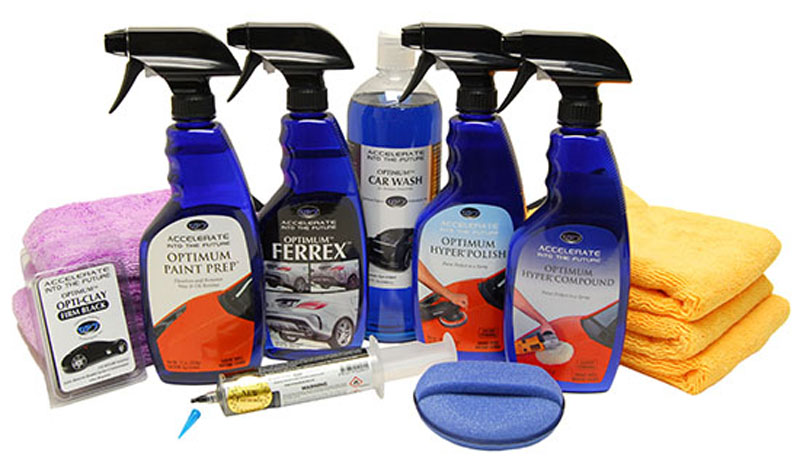 With the Optimum Complete Coating kit, you'll get everything you need to properly wash, decontaminate, compound, polish, prep, and finally coat your ride! Optimum Car Wash 32oz: Optimum Car Wash is designed to clean the toughest automotive grime while maximizing the protection of Optimum Car Wax. The rich foaming lather traps dirt and grime and rinses with cold water leaving a smooth, clean surface behind. Optimum Car Wash is very concentrated and using 0.5 oz. or less per gallon of water provides the necessary cleaning and foaming. Optimum Opti-Clay 2 x 2 oz bars: Optimum Opti-Clay is the easiest, fastest, and most effective conventional way to remove surface contaminants such as rail dust, brake dust, industrial fall out, tree sap, bug residue, and paint overspray. Your car's exterior is under constant attack from the above contamination and regular washing cannot remove it. Optimum Opti-Clay, known through out the world for its exceptional performance, is now available to customers in the US! Optimum FerreX 17oz: Optimum FerreX quickly and easily dissolves ferrous oxidesbetter known as iron particlesfrom your vehicles exterior surfaces. This acid-free, pH-balanced formula prevents the long-term damage that iron particles can cause while providing a smooth, clean surface ready for a show-car shine! Optimum FerreX not only dissolves iron particles, it also annihilates tar and old wax buildup too! Optimum FerreX dissolves ferrous oxides from exterior surfaces like paint, glass, chrome, and wheels leaving nothing behind but a smooth contaminant-free surfaceeven tar and old wax will be a thing of the past! All of that buildup of old waxes, road tar, and bump, gloss-hindering iron will be dissolved so that you can bring out the glossy shine youve been missing. Your wheels, which take a beating from brake dust, will be clean as a whistle after being cleaned with Optimum FerreX! Optimum Hyper Compound Spray 18oz: Optimum Hyper Compound was designed for professional detailers and auto body shops to cut through wet sanding marks and deep scratches in one or two passes. Optimum Hyper Compound offers all the advantages of Optimum line of polishes with long working time and zero dusting. Optimum Hyper Compound can be used at any speed on your polisher and with a wool or foam pad. When using a wool buffing pad, the compound will remove 1000 sand scratches and lighter at 1000-1400 RPM. Faster buffing speed is not needed with this product. When using a medium or heavy cut foam pad, the compound will remove 1500 sand scratches and lighter at 1000-1400 RPM. The compound works more or less aggressively depending on the pad you choose. Follow up with Optimum Hyper Polish to refine the paint surface before applying Optimum Car Wax. All Optimum products meet VOC regulations. Optimum Hyper Polish Spray 18oz: Optimum Hyper Polish is the first and only sprayable polish in the marketplace. By spraying the polish onto a buffing pad, you can effectively prime the entire pad with a minimal amount of product. Therefore you are using the entire pad to polish the paint and achieve better results in less time than a conventional polish. Just like all Optimum polishes, Optimum Hyper Polish is extremely easy to use and has a long working time with no dusting or sling issues. Its spray application minimizes the chance of overloading or gumming up the pad, and it provides an even application. Optimum Hyper Polish easily wipes off with a damp microfiber towel, whether you use it in the sun or shade, to achieve outstanding results. Optimum Paint Prep 17oz: Optimum Paint Prep is the ideal product for preparing your vehicle for application of Optimum Gloss Coat. This unique formula contains a blend of mild solvents that dissolve any wax or polish residue that will impede the bonding of the coating. Optimum Paint Prep cleans off any invisible contamination, leaving the surface squeaky clean and ready for coating! You want water beading, you want protection, and you want it to last, right? The best way to increase longevity of any last step product (LSP) is to properly prepare the surface prior to applying it. Even a smooth, perfectly polished surface will have some residue or oil left over from the products used to perfect it. Optimum Paint Prep dissolves any old waxes, compounding oils, or other residues that would otherwise prevent a coating from properly bonding. Optimum Gloss-Coat Paint Coating 20cc: Optimum Gloss-Coat is a semi-permanent coating that protects various parts of your vehicle against the elements of nature. Optimum Gloss-Coat is designed to be applied to painted surfaces, wheels, plastic trim, bumpers, aluminum, and chrome, providing the utmost in protection and shine. Optimum Gloss-Coat leaves treated surfaces smooth, slick, and well protected in any environment. A single application lasts up to three years. Optimum Gloss-Coat forms an extra layer of clear coat over your vehicle, significantly increasing the gloss, slickness, and resistance to etching caused by harsh detergents. Whats more, Optimum Gloss-Coat is less prone to scratching and marring, making it easier to keep your vehicle swirl and scratch free.